Moe, from the gene pool that brought you "Jake" and "Marbles"
Meet Moe. 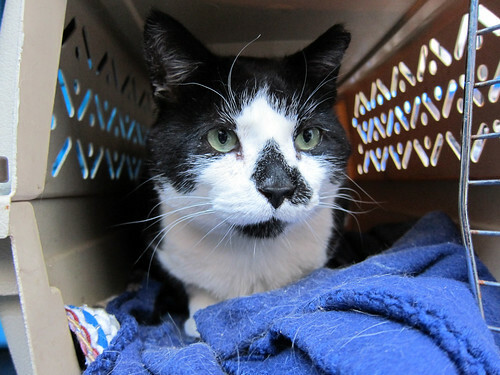 Because we're TNR-certified, we get email alerts when an eartipped cat comes into Animal Care & Control. Normally this happens when a person traps a feral cat and brings the cat to the pound. When they see the eartip, they know the cat is fixed and may belong to a managed colony. Shelter workers then send word to Neighborhood Cats (the main TNR resource in NYC and beyond) who tries to determine who the cat belongs to. If they can find the original TNR person, they can reunite them with the cat. If they can't find anyone willing to claim the cat, it will be put down almost immediately since it is feral. In these cases the cat's eartip is the only thing that gives it a stay of execution at all; the shelter can barely handle all the tame animals it houses, you can imagine its attitude towards unowned, unsocialized cats with zero adoptability. Moe's story is just another in countless similar cases, some end well but I suspect many end poorly for the cat in question. When we saw the 'Eartip Alert' message, we saw that he originally came from just a couple of blocks from our house. I thought maybe he was a cat we had fixed at some point but he wasn't in any of our records. Somebody else had fixed and eartipped him, but whoever they were, they were not claiming him. So we offered to take him to assimilate into our backyard colony. He's now set up in a big cage in the backyard, where he will live for a few weeks. 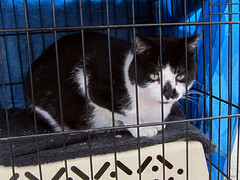 Opinions vary on how long a cat must stay caged like this to understand the property as his new turf, we usually feel 2 weeks is adequate while others crate their ferals for over a month. 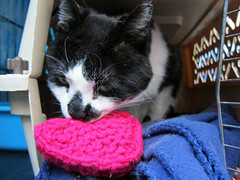 But almost immediately we realized there was even more to Moe's story: he's not feral. Moe is an extremely easy-going boy, so much so we attempted to pet him. And he loved it! He's a little unsure of what's happening but he's definitely not a wild animal. He's very well-fed too, so somebody has been taking pretty good care of him. So the question now is what to do with him. Adding a feral to our outdoor gang is not a big deal, they work as a unit and take care of each other so there's not much to do besides feeding them and occasionally cleaning their outdoor litterbox. But since Moe is tame, we really should find him a home. Unfortunately we don't have any space left inside for him, so we're going ahead with the assimilation for the time being. The other feral cats already seem quite at ease with him, and he seems absolutely serene when they come up to visit him. So I think we can provide a decent home for him until more space opens up inside. Or maybe we'll find him a real home first! 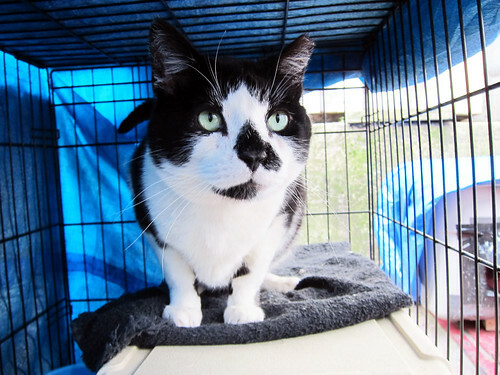 Moe would like to move out of this cage and into a home! This entry was written by Jimmy Legs, posted on April 16, 2013 at 4:00 pm, filed under Cats, Feral and tagged alert, assimilation, colony, eartip, Feral, Moe, neighborhood cats, tame. Bookmark the permalink. Follow any comments here with the RSS feed for this post. Both comments and trackbacks are currently closed.